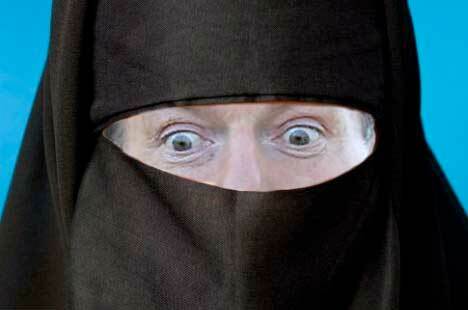 So the Parliamentary Burka ban has finally been reversed. How strange, I thought we were facing a matter of national security, how do we know who is behind that veil and how do we know they’re not carrying guns, knives, or suicide vests? Well the speaker of the House, Ms Bronwyn Bishop, and the Senate President Stephen Parry, both felt the risk was to great to ignore, so they directed anyone wearing a burka to sit in a glassed off section of the public gallery where they could be monitored, along with groups of school children. Yes, that’s right, those people we don’t trust, that hide their identity beneath a veil and could be anyone carrying anything should forced to stay with the kids. Such wonderful logical thinking from the best of our very best. Of course it was always about security, not fear of an an “unknown” culture, or “casual” racism, or victimising of women (any man that came dressed as a Muslim woman would also be segregated of course), or even blind stupidity. It was all about keeping the citizens of this great land safe… from other citizens. But of course that’s all been reversed now, there’s no longer a ban on anyone not dressed appropriately from watching the political machinery of this great nation working flawlessly. Instead we have resorted to plan B, asking the person in question to show their face to verify their identity. You have to wonder sometimes how these sorts of things get decided.